Any company that’s wanting to safeguard their valued property and assets will certainly select commercial steel doors more than any other kind. They are the most effective doors on the market today as well as the sole types that will properly provide the kind of protection and security measures that you will definitely need for any commercial business. Commercial steel doors are not only strong, they also provide the most effective fire rating, the capacity to withstand tornadoes as well as hurricanes and also they will last longer than any other. When considering selecting commercial steel doors for ones business, steel is the perfect and the sole best option. Commercial steel doors are able to handle both man-made and natural misuse much better than almost every other material frequently used regarding commercial doors. Commercial steel doors are durable, strong, and can also very easily integrate additional safety features for example impact-proofed locks, reinforced frames, reinforced fixing plates and bar lips. Also, they are galvanized to make sure they won’t degrade as time passes and they are the most effective prevention with respect to attempted break-ins. The fastest thing which unfortunately may quickly destroy your whole company in no time at all is a fire. Commercial steel doors will be the only types which have a fire rating for 3 hrs. Aluminum and / or fiberglass doors should not be utilized whenever a company needs a fire rating. Wood doors will be flammable plus the most effective wood doors merely have a fire rating of 1 hour 30 minutes. Virtually all external as well as internal commercial doors really should be manufactured from steel for fire safety measures and also to satisfy fire code requirements. In addition, commercial steel doors are considered the most hygienic door to utilize because they possess antimicrobial components, will be water and corrosion resistant and they are the actual easiest doors to fix as well as maintain in the long-haul. When considering commercial doors, steel should really be your only choice. These types of commercial steel doors will typically last at least 30 yrs perhaps longer. Any time maintenance is required, it is usually completed with minimal expense. The most frequent maintenance which will will need to be performed on steel doors is actually repairing scratches as well as dents and dings. In addition, commercial steel doors will certainly meet the test of time where by various other doors will not. Commercial steel doors are considered the most effective with regards to holding noise levels restricted to specific areas. These types of doors provide the highest possible rating with respect to sound transmissions and they are very well designed for use whenever sound reduction requirements have to be followed. Most people are conscious of the reality that doors are among the most crucial factors during the building for commercial properties because they ensure the security as well as safety within the property. Nowadays there are many commercial steel doors to select from, each one with their particular special use, overall look, and also good quality ratings, each one constructed with many different materials. Hollowed out metal commercial doors, roll-up doors, in addition to impact doors will often be utilized inside the main access points at a number of industrial and commercial sites when it comes to safety as a major concern. Commercial doors are designed to coordinate with certain requirements specific for the kind of business. 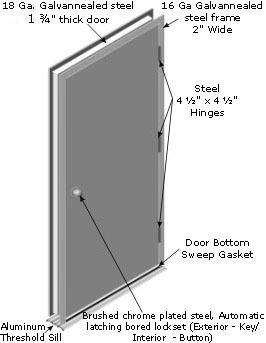 The actual commercial steel doors suppliers construct these particular doors designed for safety, security, overall visual appeal, in addition to simple operation whilst supplying easy door installation as well as high quality materials to help keep repairs and maintenance expense to a minimum amount. When a door opening necessitates sturdiness, durability or maximal heat resistance in virtually any combination, steel doors and frames supply the qualities to fulfill these particular requirements. Once preferred primarily because of their functional use or functionality, they have gone on to develop increased aesthetic characteristics while also accommodating the particular increasing options a entry needs for support. An industrial steel door entrance is a door which will withstand frequent heavy use and keep a building secure for many years. These types of doors are widely used throughout industrial environments, including educational institutions, professional complexes, in addition to storage space locations. Steel doors are generally placed inside all steel metal support frames, that will supply a better measure of support together with security over a wood made framework. 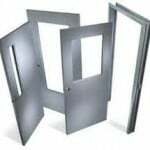 The term “hollow metal door” is generally used to make reference to any and all steel doors in order to help differentiate a swinging door from an overhead roll-up steel door. they are simply invariably the best option with regard to exterior applications. A commercial steel entrance is one of the strongest and most resilient options for securing any property, as well as being extremely resistant against weather and extreme climate. Unlike wooden doors, hollow metal entrance doors won’t reduce in size or even rot away when subjected to the weather, and they also present you with a more significant degree of insulation compared to what most wooden doors are designed for. Building of any industrial steel door starts off with selecting a core. Normal steel door cores are made of honeycombed-cardboard treated with a resinous fortifying agent. For added efficiency, polystyrene or polyurethane cores could also be used. Whenever the steel door or doorway has to be fire-rated, a mineral fiber core is needed,which is in the position to endure fire flames and temps for as much as three hours. Next, a steel skin is actually extended across the sides on the core,with various other pieces welded along the sides. The particular skin can be created from galvanized steel, which is resistant to decay as well as deterioration, or from cold-rolled alloy, which usually is much better with regard to internal installations. These sheets can be found in different gauges, generally from 20 to 14,and the lower the gauge,the tougher the doorway will be. Previous to an industrial steel door being distributed, it will be prepped to have hinges, locks, and additional door hardware. A simple industrial steel door entrance is flush, which means that it is smooth on either sides with no windows and / or openings. On stairwells and various avenues involved with travel, a small window, or lite, is normally added to make it easy for individuals to see through in advance of opening up the doorway. Located on some doors, a louver can be included to help with venting, particularly in spaces having large pieces of mechanized and / or industrial related equipment. Certain specialty selections on a steel door incorporate stamped panel styles over the face of the actual door, and / or embossed wood grain texture, which offers the perception of a solid wood door along with the toughness of a steel door within one product. 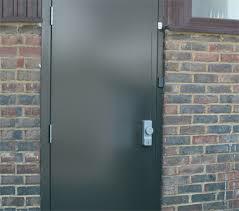 Interior & Outdoor Metal Doors are the best bet in the event that protection and durability will be major concerns. Metal models have proven to be stronger than wood or fiberglass doors, and in addition they will likely not crack or twist. Call us at Great Lakes Security Hardware for your commercial steel door needs.